Q. How is the wrist? Do you think it affected the match at all? 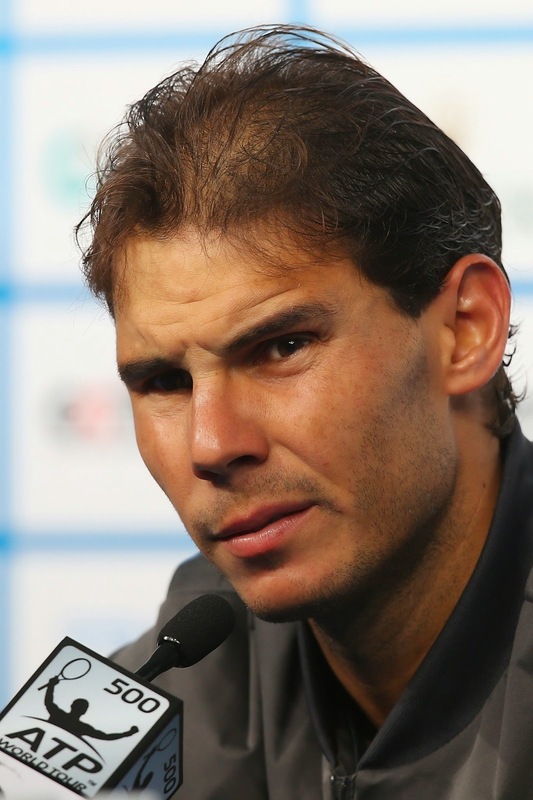 RAFAEL NADAL: I talk every day about that. Q. You don't think it affected the match at all? Q. What was the difference tonight playing against Martin? You've beaten him twice before. Was it the long time away from the court that affected your play or did he just play that well? RAFAEL NADAL: Obviously, yes. Obviously what affects this is when one player plays bad, plays without rhythm, no confidence on the shots, having more mistakes than usual, being not confident how to play the points and how to win the points, that happens, no? I was not playing well. But I had 7‑6, 4‑2, breakpoint for 5‑2, then he play more aggressive, and I play bad mistakes. That's it. When you are playing bad, the opponent is able to push you in some moment of the match like he did, is normal that he has a better chance than me to win the match. That's it, no? I say it the other day. I coming back from an injury. As I say the other day, is not the perfect conditions for me to come back. Probably is the most difficult part of the season because different facts that I spoke about the other day. But that's it. I came here to two tournaments knowing that normal things that happen like today are going to happen. Accept that. Is practice here. Shanghai, even if it's a Masters 1000, today I cannot think about big things. I have to think about day by day, trying to do the best as possible to do again quick. But I need time. Q. What would you be happy with at the end of the season? Would it be just being fit and healthy, having played a few matches? 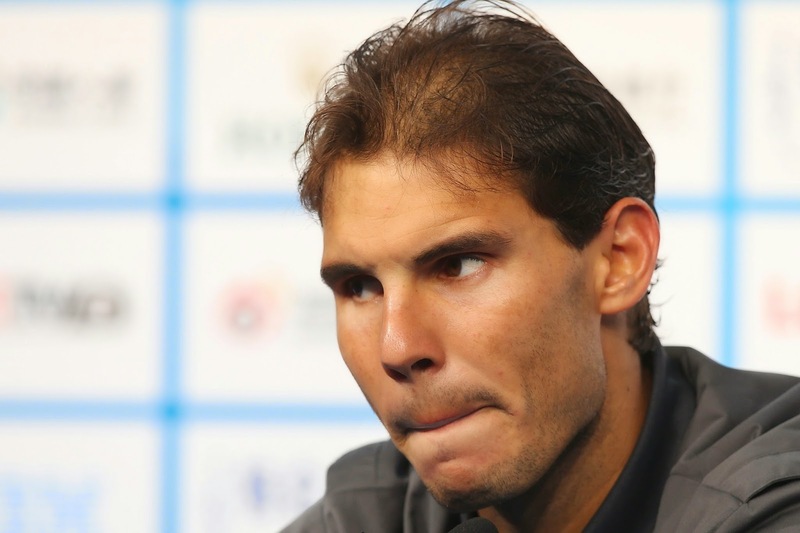 RAFAEL NADAL: I know probably going to be hard, this last part of the season, for me. It will not be easy after what happened. Always when you are outside for a few months, as I said the other day, is not the same as if you are coming back the next season that everybody start from zero. You are coming back now, and the other players are on the road, are in rhythm. Physically you feel more tired. Talking about tennis, as I said the other day, the balls and courts are difficult ones for me this part of the season, probably the most difficult ones. Shanghai is very quick. Last year was very quick. The ball is good. But is very quick. Paris and London we play with the same ball than here. So for me will be tough to find the right feelings. But I going to fight for it. I going to work hard with the right attitude to play better than what I did today. I going to try. I will be happy if I finish the season and I am able to take one week and a half holidays and I am able to practice one month with perfect conditions to try to start the next season with positive feelings. Q. Is that the reason you decided not to play the Tennis Premiere League, was to have more time to practice before Australia? Q. You decided not to play the IPTL. RAFAEL NADAL: Yeah, sorry for that. You know how I feel after having an injury in important part of the season for me. American hard court season, that always give me lot of points, lot of positive feelings. After that happened, I thought I will not be able to play in Asia this year. Will be not right for me. For me will be not the right thing to prepare the next season. I need to take care about everything. I am not 20 years old. I am 28 and a half already, and I need to take care about the things that I am doing because the most important thing for me is be competitive as long as possible for me, more than be a little bit higher or less higher on the ranking. 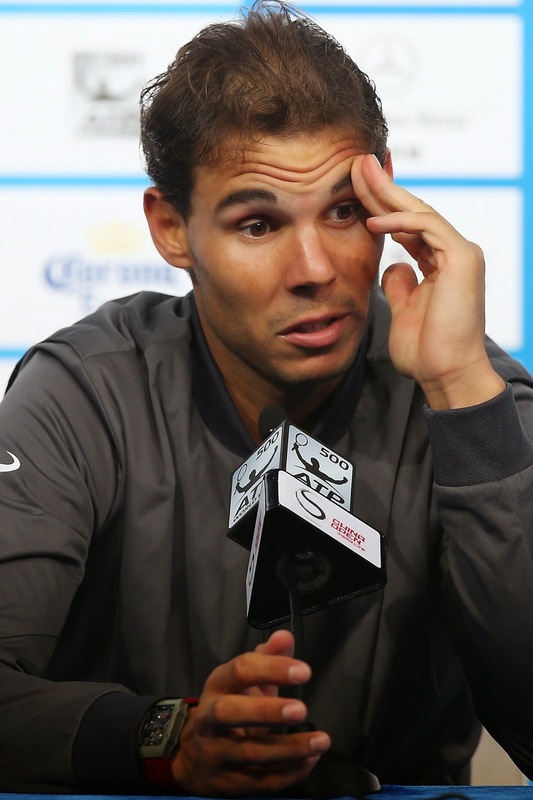 Q. Rafa, did you find that once the roof closed, did that have any effect on the match at all? RAFAEL NADAL: No. Nothing about that. Q. In your career you've had three or four times when you have been out for several months. Does it become easier or more difficult to come back after that? Q. After you've been out injured for a long time. 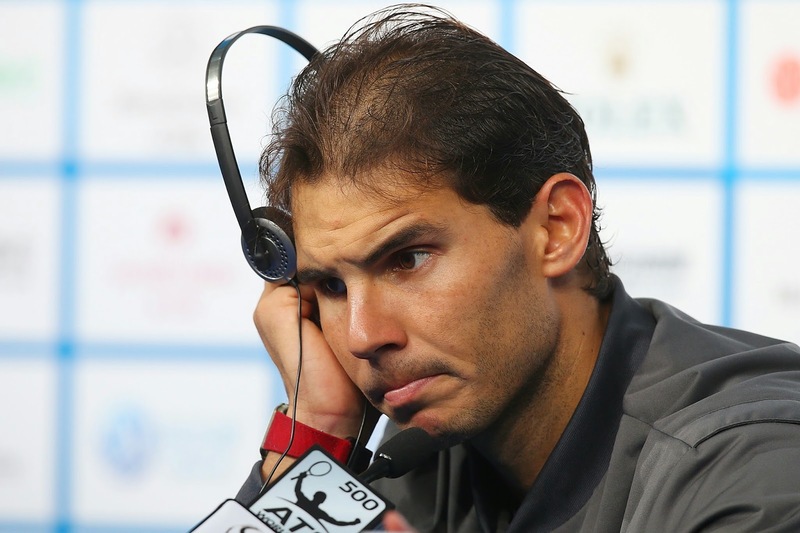 RAFAEL NADAL: More than tougher or easier, is tired, because at the same time it's like you start again from zero. Mentally is tough. Every time the same process start, bad feelings at the beginning. At the end, even if was a wrist, I was not able to practice the way I want to practice. So you start again. You feel the body not prepared as usual. Physically you feel more tired. You feel more pains in the body. You don't feel the body working as usual. That takes time. That needs matches to be fit. Is like this. But on the other side I did in the past well after an injury. I don't know if I am very positive about this last part of the season, but I am positive that I can be ready soon and be ready to compete well against everybody soon. Q. Uncle Toni was saying he chose to walk away as your coach even before you have retired. Is that something you have discussed with him? Q. Uncle Toni said he may choose to walk away as a coach before you retire because he has a life to live. He thinks it's too much for him to handle the travelling. Is that something you have discussed with him? RAFAEL NADAL: No. He say that he is not going to be my coach until the end of my career, is that what he said? 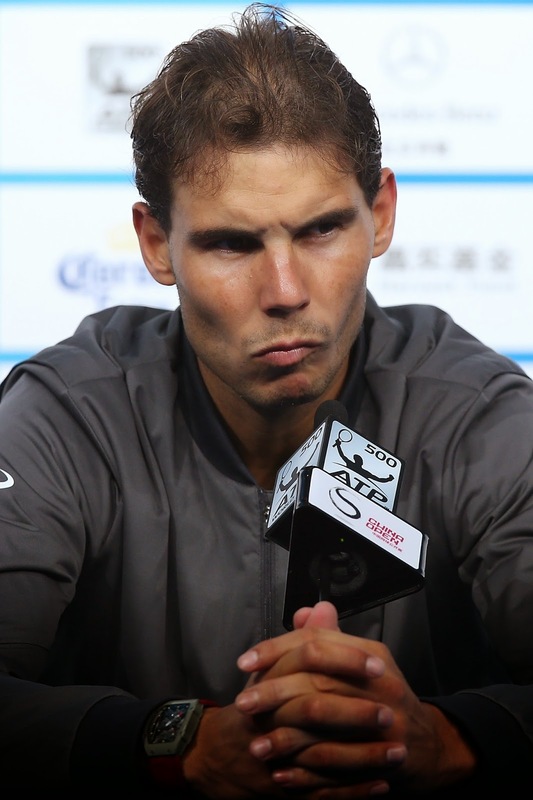 RAFAEL NADAL: When he said that? Q. I just read from some reports that he was saying that. You have no idea about this? RAFAEL NADAL: First news. Still my coach, I think. He didn't tell me another thing. Talked with him yesterday on the phone. Q. Klizan in last year's French Open and Wimbledon this year got one set from you. Today he got two sets from you and won the match. From your perspective, what kind of changes have you noticed in him so that he could win the match? Do you think left‑handers pose more challenges to you than the right‑handers? RAFAEL NADAL: First of all, congratulate him for the victory. Is obvious that he did better than me. That's why he beat me. Always when somebody wins against another player, and he lost in the past, we have to talk about the changes that he did to make that happen. I don't know. Only thing I see from my perspective that changed was I was not able to push him back. I was not able to play as I normally do when I am playing well. He's a good player. He's able to play with good shots. That's it. He beat me. The sport is not difficult. Is easy. When one player plays bad, the other plays better, normally the one who plays better win, and that's what happened today. Q. When we were watching the match, we thought you had a lot of errors on your forehand, that your forehand condition is worse than your opponent's. Do you think the forehand was a major cause to the result today or any other reasons to explain the loss today? RAFAEL NADAL: Well, forehand is an important part of my game, is obvious. If I am not playing well with my forehand, is obvious that I have a problem. Is obvious that today I had the problem. That's it. Is not all about the forehand. The forehand is an important part. But the movements, the way that I am recovering from a not very bad position, but normal positions, I think he was able to find winners too easy. When I was defending, I was not able to play the ball long. Normal things that somebody does when one plays bad and I don't do when I'm feeling well physically, when I'm feeling quick on court, feeling that the opponent needs to hit a very good shot to create a winner. Today was not the case. When that happens, like I said before, that's it.